Lo, A. Y., Alexander, K., Proctor, W., Ryan, A. Reciprocity as deliberative capacity: lessons from a citizen’s deliberation on carbon pricing mechanisms in Australia. Environment and Planning C: Government and Policy, 31(3):444–459, 2013. Colaborative approaches to water management and planning: An institutional perspective. The economic impact of increased water demand in Australia: A computable general equilibrium analysis. Economic Papers: A journal of applied economics and policy, 31(1):87-102, 2012. Straton, A.T., Jackson, S., Marinoni, O., Proctor, W., Woodward, E.
Exploring and evaluating scenarios for a river catchment in Northern Australia using scenario development, multi-criteria analysis and a deliberative process as a tool for water planning. Water resources management, 25(1):141-164, 2011. Lennox, J., Proctor, W., Russell, S.
Structuring stakeholder participation in New Zealands water resource governance. Cook, D., Proctor, W., Liu, S.
Using an integrated fuzzy set and deliberative multi-criteria evaluation approach to facilitate decision-making in invasive species management. Pearson, L., Coggan, A., Proctor, W. and Smith, T.
A sustainable Decision Support Framework for Urban Water Management. Water Resources Management, 24(2):363-376, 2010. Qureshi, M.E., Shi, T., Qureshi, S.E. and Proctor, W.
Removing barriers to facilitate efficient water markets in the Murray-Darling Basin of Australia. Agricultural Water Management, 96(11):1641-1651, 2009. Pascoe, S., Proctor, W., Wilcox, C., Innes, J., Rochester, W. and Dowling, N.
Stakeholder objective preferences in Australian Commonwealth managed fisheries. Connor, J., Ward, J., Clifton, C., Proctor, W. and Hatton MacDonald, D.
Designing, testing and implementing a trial dryland salinity credit trade scheme. Cook D. and Proctor, W.
Assessing the threat of Exotic Plant Pests. Sell, J., Koellner, T., Weber, O., Proctor, W., Pedroni, L. and Scholz, R. W.
Ecosystem services from tropical forestry projects — The choice of international market actors. Forest Policy and Economics, 9(5):496-515, 2007. Proctor W. and Drechsler, M.
Environment and Planning C: Government and Policy, 24(2):169-190, 2006. Cork, S. J. and Proctor, W.
Implementing a process for integration research: Ecosystem Services Project, Australia. Journal of Research Practice, 1(2):Article M6, 2005. Book Review: Romero, C. and Rehman, T. Multiple Criteria Analysis for Agricultural Decisions. Australian Journal of Agricultural and Resource Economics, 48(3):562-565, 2004. Cork, S., Proctor, W., Shelton, D., Abel, J. and Binning, C.
The ecosystem services project: Exploring the importance of ecosystems to people. Ecological Management & Restoration, 3(2):143-146, 2002. Ross, H., Buchy, M., and Proctor, W.
Laying down the ladder: A typology of public participation in Australian resource management. Australian Journal of Environmental Management, 9(4):205-217, 2002. Proctor, W., Waage, S. Lehmann, M., Bishop, J., Borges, B., Koellner, T., Lukasiewicz, A. The two sides of IPES transactions: exploring the motivations for demand and supply. Chapter 3 in Bishop, J. and Hill, C. (Eds. ), Global Biodiversity Finance: The case for International Payments for Ecosystem Services, Edward Elgar Publishing, UK, 2014. In Argyrous, G. (Ed. ), Evidence for policy and decision-making: A practical guide, chapter 4. University of New South Wales Press, Sydney, 2009. Proctor, W., Koellner, T. and Lukasiewicz, A. In P. Kumar and Muradian, R. (Eds. ), Payments for Ecosystem Services, pages 17-43. Oxford University Press, New Delhi, 2009. Proctor, W., Connor, J., Ward, J. and Hatton MacDonald, D.
Encouraging revegetation in Australia with a groundwater recharge credit scheme. In P. Kumar and Muradian, R. (Eds. ), Payments for Ecosystem Services. Oxford University Press, New Delhi, 2009. Gaehwiler, M., Gross, B., Koellner, T., Proctor, W. and Zilberman, D.
In P. Kumar and Muradian, R. (Eds. ), Payments for Ecosystem Services, pages 166-193. Oxford University Press, New Delhi, 2009. Proctor, W., McQuade, C. and Dekker, A. Managing Environmental and Health Risks from a Lead and Zinc Smelter: An Application of Deliberative Multi-criteria Evaluation. In Martinez-Alier, J. and Ropke, I. (Eds. ), Recent Development in Ecological Economics, volume 2, chapter 11. Edward Elgar, Cheltenham, 2008. Hatton MacDonald, D. and Proctor, W.
The Economic Dillemas of Water Management and Reuse. In Jimenez, B. and Asano, T. (Eds. ), Water Reuse: An International Survey of current practice, issues and needs, pages 299-315. IWA Publishing, London, 2008. In Herath, G. and Prato, T. (Eds. ), Using multi-criteria decision analysis in natural resource management, pages 61-74. Ashgate Publishing Ltd., Hampshire, 2006. MCDA and Stakeholder Participation: Valuing Forest Resources. In Getzner, M., Spash, C. and Stagl, S. (Eds. ), Alternatives for Environmental Valuation, pages 134-158. Routledge, New York, 2005. Williams, J. Dovers, S., Burgman, M., Proctor, W., Norton, T. and Read, C.
In Australia State of the Environment 2001, pages 69-81. CSIRO Publishing on behalf of the Department of the Environment and Heritage, Canberra, 2001. Dargavel, J., Proctor, W. and Kanowski, P.
Conflict and Agreement in Australian Forests. In Tacconi, L. (Ed. ), Biodiversity and Ecological Economics - Participatory Approaches to Resource Management. Earthscan, London, 2000. Reflecting on integrated mission directed research: Learning from experience in environmental and natural resource management. Environmental Decision Making: An Application of Multi-criteria Analysis to a Case Study of Australia's Forests. Lambert Academic Publishing, Saarbrücken, 2009. Abel, N., Cork, S., Gorddard, R., Langridge, J., Langston, A., Plant, R., Proctor, W., Ryan, P., Shelton, D., Walker, B. and Yialeloglou, M.
Natural Values: Exploring Options for Enhancing Ecosystem Services in the Goulburn Broken Catchment. CSIRO Sustainable Ecosystems, Canberra, 2003. Multi-Criteria Analysis And Environmental Decision-Making: A Case Study Of Australia's Forests. PhD thesis, Centre for Resource and Environmental Studies, The Australian National University, 2001. Cook, D. and Proctor, W.
Deliberative Multi Criteria Evaluation: The Wherefore and the Why. Proceedings of the Structured Decision Analysis for Biosecurity and Resource Management Conference, Department of Agriculture, Fisheries and Forestry and the Australian Centre of Excellence for Risk Analysis, Canberra, April 5-7, 2008. Proceedings of the Participatory Approaches to Science and Technology Conference, Edinburgh, Scotland, June 5-7, 2006. Proctor, W., Qureshi, M.E., Wittwer, G. and Young, M.
A participatory approach to water management in the face of climate change. Proceedings of the Ecomod International Conference on Regional and Urban Modeling, Brussels, June 1-3, 2006. Qureshi, M. E., Proctor W., and Kirby, M.
Economic assessment of water trade restrictions in the Murray Darling Basin. Proceedings of the Ecomod International Conference on Regional and Urban Modeling, Brussels, EcoMod Network, June 1-3, 2006. Wittwer, G., Young, M., ,Proctor, W., Dixon, P. and Qureshi, E.
Modelling future urban and rural water requirements in a CGE framework. Australian Agricultural and Resource Economics Society Conference, Manly, 2006. Proctor, W. and Qureshi, M.E. Proceedings of the Australia New Zealand Society for Ecological Economics Conference, Massey University, Palmerston North, New Zealand, 11-13 December. NZCEE, 2005. Qureshi, M., Proctor, W. and Young, M.
Economic Impacts of Water Resources Management in the Murray Darling Basin, Australia. Proceedings of the XII World Water Congress, Water for Sustainable Development - Towards Innovative Solutions (New Delhi, India), pages 22-25. IWRA, November 2005. Proctor, W., Dekker, A and McQuade, C.
Developing a Tool to Determine Priorities for a Lead Smelter Environmental Improvement Program. European Society for Ecological Economics Conference, Lisbon Portugal, 14-17 June, 2005. Cork, S. and Proctor, W.
Interdisciplinary Research - Ecosystem Services. Mobbs, C. (Ed. ), Proceedings of the Land and Water Australia Integration Symposium, May 5-6 Canberra, Land and Water Australia, Canberra, 2005. Proctor, W. and Ward, J. A management framework to design and test policy instruments and institutional settings to enhance the provision of ecosystem services. International Conference on Integrated Assessment of Water Resources and Global Change: A North-South Analysis, Bonn, Germany, 23-25 February, 2005. Proctor, W. and Drechsler, M.
57th Meeting of the European Working Group on Multi-criteria Decision Analysis, Viterbo, Italy, March 2003. Deliberative Multi-criteria Evaluation: A case study of recreation and tourism options in Victoria. European Society for Ecological Economics, Frontiers 2 Conference, Tenerife, February 2003. Whitten, S., Salzman, J., Shelton, D. and Proctor, W.
Markets for Ecosystem Services: Applying the concepts. Proceedings of the 47th Annual Conference of the Australian Agricultural and Resource Economics Society, Fremantle, Western Australia, February 2003. Australia New Zealand Society for Ecological Economics Conference, Institute of Technology, Sydney, December 2002. Proctor W., Cork S., Langridge J., Langston A., Abel N., Howden, M., Anderies M., Parry, R. and Shelton D.
Assessing Ecosystem Services In Australia. 7th Biennial Conference of the International Society for Ecological Economics, Sousse, Tunisia, 6-9 March 2002. The Ecosystem Services Project in Australia. German Working Group on Operations Research Meeting, Stuttgart, Germany, March 2002. 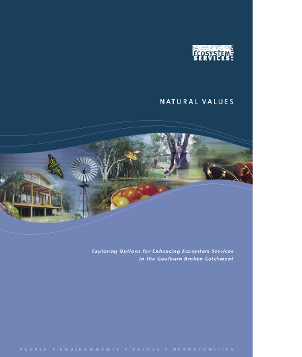 Valuing Australia's Ecosystem Services Using a Deliberative Multi-Criteria Approach. European Society of Ecological Economics Conference Frontiers 1, Cambridge, UK, July 4-7, 2001. Can Multi-criteria Analysis Aid the Process of Environmental Policy-making? International Society for Ecological Economics 2000 Conference: Operationalising Ecological Economics, The Australian National University, Canberra, Australia, 5-8 July, 2000. Towards Sustainable Forest Management: An application of Multi-Criteria Analysis to Australian Forest Policy. Third International Conference of the European Society for Ecological Economics, May 3-6 2000, Vienna, Austria 2000. A Practical Application of Multi-criteria Analysis to Forest Planning in Australia. In Sisak, L., Jobstl, H. and Merlo, M. (Eds. ), Proceedings of the Symposium - From Theory to Practice: Gaps and Solutions in Managerial Economics and Accounting in Forestry, Prague May 13-15, 1999. Proctor, W. and Dennis F.
Modelling Demand for Seafood in South Korea using MAIDS. 24th Conference of Economists, Adelaide, September 1995. Hatfield-Dodds, S., Feeney, K., Shepherd, L., Stephens, J., Garcia, C., Proctor, W.
The Carbon Price and the Cost of Living: Assessing the impacts on consumer prices and households. A report to The Climate Institute prepared by CSIRO and AECOM, 2011. Proctor, W., Hosking, K., Carpenter, T., Howden, M., Stafford Smith, M. and Booth, T.
Future Research Needs for Climate Adaptation in the Murray Darling Basin. CSIRO Report to the Murray Darling Basin Authority, June 2009. Williams, A. Crossman, N., Coggan, A., Collard S., Yang, W., Proctor, W., Carter, M., Kinnane, E., Bartsch, D. and Bryan, B. Developing Environmental Markets in South Australia. CSIRO Report to the South Australian Government, June 2009. Crossman, N., Williams, A. Coggan, A., Collard S., Proctor, W., Kinnane, E., Jaunay, L., Bartsch, D. and Bryan, B. Establishing a Biodiversity Market for South Australia: Stage 1 - Review and Scoping. Bryan, B., Kandulu, J., Frizenschaf, J., White, M., Deere, D., Bradford, G., Ward, J., Proctor, W., Billington, K., Lewis, N., Bonnett, M., and Crossman, N.
Designing cost-effective socially acceptable policy for mitigating agricultural non-point source pollution: Cryptosporidium risk in the Myponga catchment. Qureshi, ME, Shi, T, Qureshi, S., Proctor, W and Kirby, M.
Removing barriers to facilitate efficient water markets in the Murray Darling Basin - a case study from Australia. Maheepala, S., Grant, A., Schandl, H., Oliver, R., Blackmore, J., Proctor, W., Ashbolt, S., Baynes, T., Gilles, J., Grigg, N., Habla, W., Hoskin, K., Measham, T., Mirza, F., Qureshi, E., and Sharma, A.
Canberra integrated waterways: feasibility study. CSIRO Water for a Healthy Country National Research Flagship report CSIRO, 2009. Cook, D., Liu, S. and Proctor W.
Deliberative Methods for Assessing Utilities. Report prepared for the Australian Centre of Excellence for Risk Analysis; under review. Hatfield Dodds, S. and Proctor, W.
Delivering on the Promise of Stewardship - Issues in realising the full potential of Environmental Stewardship Payments for landholders and the land. A discussion paper prepared for the Australian Conservation Foundation, CSIRO Sustainable Ecosystems, Canberra. 39pp. 2008. Tan, P.L., Jackson, S., Oliver, P., Mackenzie, J., Proctor, W. and Ayre, M.
Collaborative Water Planning: Context and Practice. Literature Review. Volume 1. Topical Rivers and Coastal Knowledge Report. September 2008. Straton, A., Jackson, S., Marinoni, O., Proctor, W. and Woodward, E.
Evaluation scenarios of the Howard catchment: Summary report for workshop participants and stakeholders. CSIRO Sustainable Ecosystems, Darwin, 2008. Chichilnisky, G. and Proctor W.
International Payments for Ecosystem Service. Overview report for the CBD Convention of the Parties 9th Meeting, Bonn, Germany, May, 2008. CSIRO Research on Incentives for Biological Diversity. Summary Report to the Secretariat of the Convention on Biological Diversity, Jan, 2008. Equity Considerations and Payments for Ecosystem Services. Discussion Paper Series, Environmental Economy and Policy Research, University of Cambridge, Dept. of Land Economy, No. 31. 2008. Grant, G. Maheepala, S. Schandl, H. Ashbolt, S. Measham, T., Mirza, F. Hoskins, K. Proctor, W. Blackmore, J., Baynes, T., Qureshi, E. Sharma, A. Oliver, R. Grigg, N. and Pavelic, P.
Provision of Canberra Integrated Waterways. Feasibility Study, Stage 1 Report, CSIRO Report for the ACT Dept. of Territory and Municipal Services, 2008. Proctor, W., Comerford, E., Hatfield Dodds, S., Stauffacher, M. and Wilkinson, S.
Motivating Change In The Catchment: A guide to revegetation design and incentives for catchment management bodies. Proctor W, Connor JD, Ward J, MacDonald D.H.
Socio-Economics and the Environment in Discussion (SEED). CSIRO Working Paper Series Number 2007-06. May 2007. ISSN 1834-5638. 33 pp. Young, M., Proctor, W., Qureshi, E. and Wittwer, G.
Without Water: The economics of supplying water to 5 million more Australians. CSIRO Report No. 1/06, 2006. Connor, J., Dyack, B., Proctor, W., Overton, I. and Hatton MacDonald, D.
Evaluation of options to integrate economic and ecological objectives of salinity management in the MDBC Basin Salinity management Strateg. CSIRO Report to the Murray Darling Basin Commission, March 2006. Criteria for Assessing Proposals for the Kimberley Water Source Project. Report to the Western Australian Department of Premier and Cabinet, CSIRO Report, May 2005. Cork S., Proctor W., Langridge J., Langston A., Abel N., Howden, M., Anderies M., Parry, R. and Shelton D.
Assessing Ecosystem Services In The Goulburn Broken Catchment. Second Milestone Report To Land And Water Australia, 14 December, 2001. Buchy, M., Ross, H. and Proctor, W.
Enhancing the Information Base of Participatory Approaches to Australian Natural Resource Management. Commissioned Report to the Land and Water Resources Research and Development Corporation, Canberra, 2000. Dargavel, J., Conley, K., Proctor, W., Ferguson, I. and Bhati, U.N. Direct and indirect employment in the forest sector and forest sector employment as a proportion of total employment. Report on Montreal Process Project 6.5a to the Wood and Paper Industry Strategy, Canberra 1999. Proctor, W. and Straton, A.
Sustainability Assessment: Accounting for the Triple Bottom Line. ECOS Magazine, CSIRO Publishing, Issue 147, Feb-Mar 2009. Proctor, W. and Lukasiewicz, A. Taking it Global: International Payments for Ecosystem Services. World Conservation, International Union for the Conservation of Nature, May 2008. Incorporating People's Views into the Valuation of Ecosystem Services. RipRap: River and Riparian Lands Management Newsletter, 21:22-24, Reprint no. 4347, Land and Water Australia, 2002. Forestry Decision A Wasted Opportunity. Canberra Times, Science and Technology Section, 31 August, 2000. The East Gippsland Comprehensive Regional Assessment: Economic Assessment. Report to the Commonwealth Forest Task Force, 1996. Ockerby, J., Proctor, W., Corder, C. and Dann, T.
Financial Performance Indicators for Drought Exceptional Circumstances. Report to the Bureau of Resource Sciences, 1996. Smith, P., Dennis, F. and Proctor, W.
South Korean Market for Seafood. ABARE Research Report 96.3, Canberra, 1996. Farm Characteristics and Portfolio Risk. Report to the Westpac Banking Corporation, 1994. Morris, P., Roper, H., Short, C., Proctor, W. and Connolly, G.
China's Wool Textile Industry: Strategies for Grow. ABARE Research Report 93.9, Canberra, 1993. Proctor, W., Phillips, B., Kelly, J. and Van Hilst, R.
Abdalla, A., Kelly, J. and Proctor W.
1991 Wine Grapes Supply Projections To 1993-94.